Il Podere is a typical Tuscan colonial house, on the hills of Chianti Classico, close by Gaiole in Chianti. 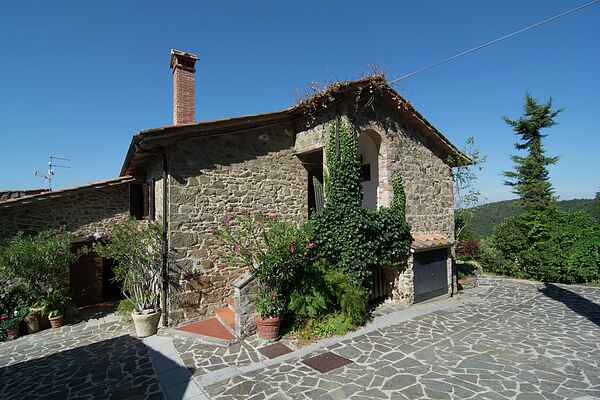 The property boasts an absolutely panoramic, breath taking view on the woods and hills, till Siena. The accommodation consists of 7 finely furnished apartments, equipped with all services, as well as a big swimming pool (7,5x15m) in a panoramic position, with sunchairs, mats and parasols. This is a clear invitation to relax and get lost in the surrounding greenery. Il Podere, isolated and quiet, is ideal for those who wish to get away from the daily hassle and dive into nature. Summer nights are pleasantly cool, being the property at 700m above sea level. All the regional touristic attractions are at a stone's throw. Immersed in the hills, it's less than 60km from Florence and 30km from Siena. After a busy sightseeing day, guests can really enjoy the authentic Tuscan lifestyle. Recommended tours in the surrounding area are typical villages such as San Gusme, Villa a Sesta San Felice, Vertine, San Sano, Volpaia and Radda in Chianti and Castles and Borgos such as Castello di Meleto Brolio or the Badia a Coltibuono. The markets in the region are well worth a visit. For day trips we recommend excursions to Siena, the city of Alabaster Volterra and San Gimignano, the city of towers or to Florence, Cortona and Arezzo. Drive along the Chiantigiana the Chianti road and take a look around in the villages of Castellina, Panzano and Greve or explore the Sienese Creten and the towns of Pienza, Montepulciano and Montalcino. Among the best moments of Tuscany travel without question is the wine tasting in the Chianti Classico area. As an introduction to the Secrets of Chianti the owner proposes a winetasting every Thursday and Sunday at 16:00!